In a week dominated by headlines about bloodshed, protests, and inequality in the era of the nation’s first black president, one tweet on Friday got to the heart of the matter: "For black lives to matter, black #education has to matter," wrote the Twitter user UndercoverBAT, a pseudonym for a public school teacher. To that end, this weekend dozens of public education activists and advocates are convening in Washington, D.C., to push for a national agenda they argue can keep poor and minority children out of prison, level the economic playing field with whites, and help the nation compete in the global, tech-based economy. The participants in the annual Save Our Schools conference are intent, however, on pushing back against what they see as the privatization of the nation’s schools—including the promotion of charter schools in places like Detroit and New York City, unequal school funding among white and minority districts, and the scant attention presidential candidates Hillary Clinton and Donald Trump have paid to the K–12 public education issue on the campaign trail. “We just thought it was time to come back to D.C. and raise these issues again,” Anthony Cody, one of the event’s organizers, told TakePart. Education, he said, “is one of the most important issues that affects hundreds of millions of people” but typically isn’t taken seriously by most politicians. Education “is sort of a third rail,” he said. But for Jonathan Kozol, the education activist and author who is participating in the education sessions and a march on the White House, education is no less than a fundamental civil rights issue. 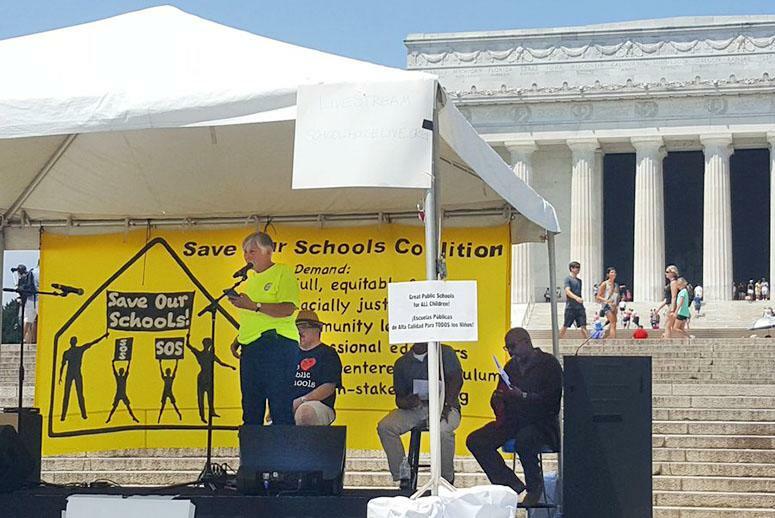 “Nationally, the issues that are being raised at the SOS rally are very close to my heart,” said Kozol, who taught in underserved schools and participated in the civil rights movement to break what he calls the apartheid of segregation in 1960s. “I still happen to believe that Dr. Martin Luther King Jr. was right—I believe his actual dream” of true equality was built on education. Though the Save Our Schools conference agenda is broad and leans to the left—full, equitable funding for all public schools, community leadership in public school policies, child-centered, culturally appropriate curricula for everyone—the primary goal is to raise awareness of disparity in public education and what Cody calls a corporate takeover of public education. That includes the recent proliferation of high-stakes testing, which critics say is driven by education giants such as McGraw-Hill, Harcourt, and NCS Pearson. Cody sees the same motives driving the push for charter schools in Detroit, which recently announced it would depend on the taxpayer-funded, committee-run schools to rebuild Motown’s moribund districts. While education reform activists argue that the evaluations are crucial to teacher accountability and ensuring students in underserved districts have high-performing educators, critics say they’re being used to punish teachers and manipulate school funding, giving poor schools the short end of the revenue stick. High-stakes testing and charters have “had a destructive effect and destroyed the aims of public education,” said Kozol. “This agenda has been foisted primarily by the business world” and has traded the teaching of critical-thinking skills for a teach-to-the-test culture—particularly in struggling poor and minority neighborhoods. “In these heavily tested inner-city schools, these kids aren’t asking questions,” Kozol said. “They’re spitting out answers,” and the achievement gap hasn’t budged. Kozol participated in the SOS conference and march, he said, because he senses widespread dissatisfaction among parents about the shift toward standardized tests and charter-run schools. The conference, he said, is a prime opportunity to put those issues on the national agenda, force leaders at the national and local levels to pay attention, and in the process improve conditions for the children who need it most. Take the Pledge: If We Don’t Act Now, Who Will Teach Our Kids?